SCRABBLE: 14 points; GRAFFITI: 15 points; MARRIAGE: 11 points; YES: 6 points. When playing a game of Scrabble, those are the minimal amount of points for each of the given words (not including blank tiles). But for 28-year-old Jeff Gurwin, it's more than just 46 points on the board, it's a lifetime of happiness. 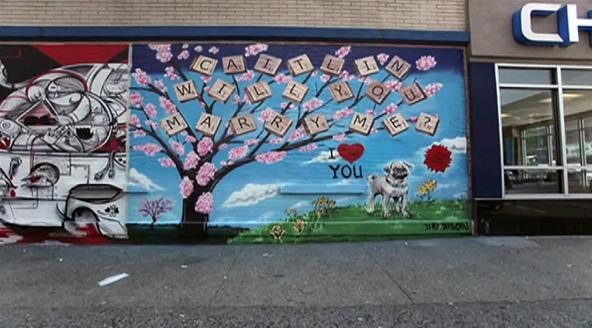 Into a mural painted that popped the question: Caitlin, will you marry me? 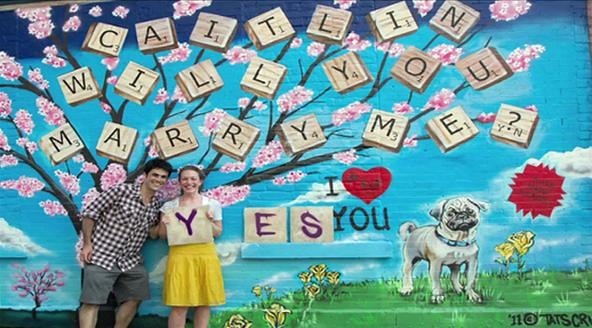 The graffitied proposal was written out in Scrabble letters, a symbol of their love for the game, and the large pug was an artistic rendition of Caitlin's mother's dog, Parky. Caitlin was walking to meet Jeff for dinner when she saw it—her proposal. When she approached the street art, Jeff got down on one knee and asked her hand in marriage. The time lapse photography video below shows the creation of the street art, the actual proposal and subsequent joy. Now, just one question: What will their wedding look like? Apparently, the mural will be up for about a month, so if you're in East Village drop by and check it out.